No other tire in the history of ATV racing has claimed more individual victories and series championships-in every form of competition imaginable-than the ITP Holeshot. ITP is determined to keep this legacy alive with the introduction of the all-new Holeshot SX, the most technologically advanced motocross tire ever. The Holeshot SX has been carefully designed and painstakingly developed to dominate on hard-packed motocross tracks. Key to this process was the extensive input of several National-caliber race teams and riders, who specifically requested a tire that could excel on this type of MX course. The drier, slicker and faster the track surface - a very common condition in today's racing environment the greater an advantage the Holeshot SX rider will enjoy. The new Holeshot SX is being offered in both front and rear configurations, each with its own unique characteristics yet built to perfectly complement each other as a package. Specifically designed and developed to dominate on the hard-packed MX tracks so common in ATV racing today. The drier and slicker the track surface, the greater advantage the Holeshot SX rider will enjoy. Rear Holeshot SX utilizes a specially reinforced carcass that minimizes stretching while maintaining a flat profile, providing consistent feel and performance without a sacrifice in ride comfort. 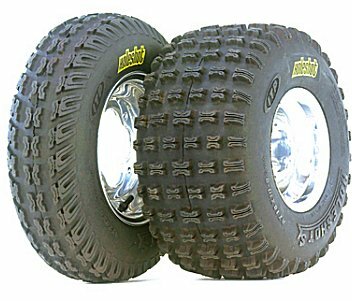 New "RR" tread compound yields unmatched hard-pack performance as well as surprisingly long life (getting more motos out of a set of tires was a primary design goal). Rear SX tread pattern uses more tightly-spaced knobs to increase tire contact patch, while the redesigned knobs have been laterally sipped (thinly cut), which results in twice the number of biting edges than any Holeshot that's come before. Rear Holeshot SX shoulder knobs utilize a new tapered shape for greater control during corner transitions. Front Holeshot SX also incorporates a tighter knob pattern and sipped knobs for increased contact area, improved steering response and better braking control in hard-pack conditions. Front Holeshot SX uses the "RR" tread compound to keep the knob edges sharper longer, while the reinforced carcass also magnifies cornering precision. A secondary benefit of the new carcass design is that it allows for lower tire pressures than in the past, enhancing ride comfort as well as steering traction. Find your tire size in the chart above and then select your tire size below for ordering. Prices vary by tire size, and start at $82.95. The price listed above will match the price of the item added to the cart.